Nothing quite beats a delicious homemade dessert. Ordering a dessert at a restaurant is a treat, and even buying something premade at the store can satisfy a sweet tooth. But, there’s something special about baking something at home, whether you’re enjoying it yourself or sharing it with others. If you’re looking for a fantastic dessert to make, consider trying our recipe for an easy French silk pie. This simple pie has two layers to it — a deliciously light chocolate layer topped with a layer of delectable homemade whipped cream. Keeping it in the fridge overnight lets the flavors of both flavors come out even more and allows the pie to set enough to reach a good consistency. This pie is meant to be shared — while you may be tempted to save it all for yourself, your friends and family will love you for sharing it with them. If you want to learn how to make an incredible French silk pie, check out our recipe below! Bake the pie crust according to the instructions on the packaging. Once the pie crust is out of the oven, set it aside and let it cool completely. While the pie crust is cooling, prepare the filling. Beat the butter and sugar with a hand mixer on medium to medium-high. Beat the butter and sugar until light and fluffy, about five to seven minutes. Melt the chocolate. Pour some water in a saucepan and boil. Place a bowl over the pan with the chocolate and some butter to keep from burning. Stir the chocolate until it melts completely. Once the chocolate has melted, allow it to cool. Combine the butter mixture and the melted chocolate and add the vanilla extract. Beat the mixture until well-combined. Beat in the eggs two at a time. Beat for four to five minutes after each addition. Make sure your pie crust is thoroughly cooled. Combine the confectioners’ sugar and the whipping cream. Beat on medium-high to high until peaks form. You know the whipped cream is done after you turn the mixer off, lift the beaters, and the cream sticks up in points. Add the whipped topping to the top of the chocolate. Take a sheet of plastic wrap and cover the pie. Put it in the refrigerator and let it sit overnight. Before cutting, shave some more chocolate to garnish the top. Cut the pie into slices and serve. 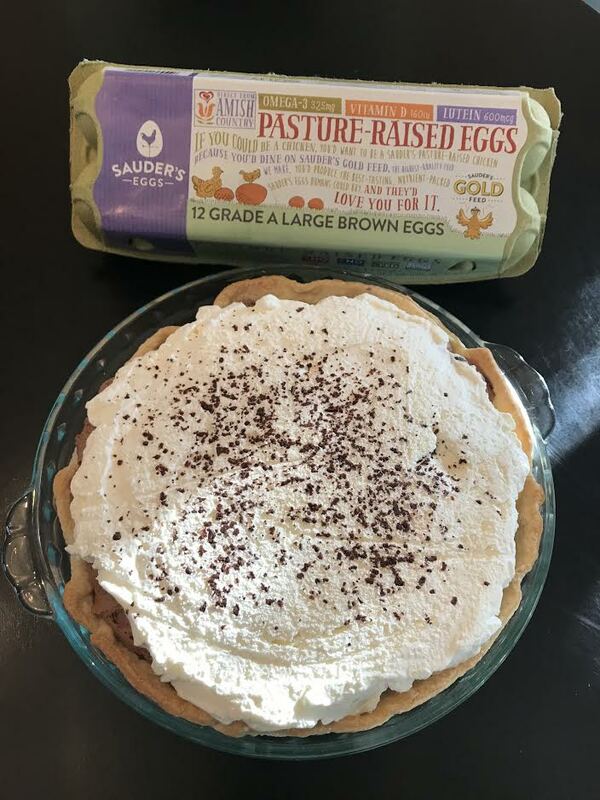 At Sauder’s, we know you want to use the best ingredients to bake and cook. That’s why we’re dedicated to providing eggs that are of the highest quality and freshness. To find our top-quality eggs at your nearest grocer, make sure to use our store locator today!